Briargate is Master Planned Community with about 43,000 residents in the El Paso county of North Colorado Colorado Springs, CO. The Area was first developed in the 1980's and continues to see new real estate development today. Homes in this area can go as low as $175K to $750K in the newer developed areas of Briargate with a median price home of $256,200. The Middle to Upper Middle Class Residents of Briargate enjoy amazing mountain views, an wide array of outdoor activies including the widely renowned Pine Creek Golf Course. 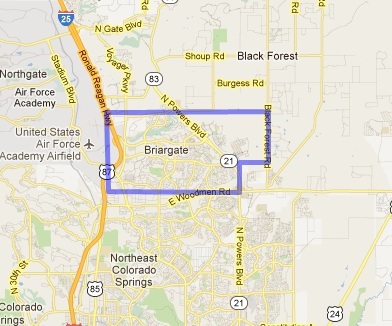 The northeast location makes Briargate ideal for commuters to the Air Force Academy, however many military personnel who commute to Peterson Air Force base and Fort Carson choose the Briargate area as their home. Briargate has many attractions including the Promenade Shops at Briargate and The Chapel Hills Mall. Briargate features the highly coveted District 20 Schools that recieved the prestigious Colorado Department of Education "Acredited with Distinction" Award. Many new residents of Colorado Springs specfically request Disctrict as their District of choice because of this award and the benefits of a District 20. Commuting to and from the Briargate area is easy. Briargate Boulevard intersects with both I-25 and the Powers Corridor making getting most places in Colorado Springs easy and convenient. With tons of shopping and outdoor activities, a great schooling system, and some beautiful homes, Briargate would be a great place for you to call home. Search the #1 site for Briargate Real Estate listings.